Smallville fans have a lot to be happy about these days. The CW has officially renewed the show for its tenth season after strong performances on Friday nights and a creative resurgence due in no small part to the airing of “Absolute Justice,” the two part Justice Society episode by Geoff Johns. Here’s one more reason to jump on your couch and get excited. The JSA will return to Smallville before the season 9 finale. This isn’t the only hint that the JSA would bbe back soon. In November, Michael Shanks (Hawkman) hinted to fans he might be returning in future episodes to mentor Clark Kent. Additionally, Johns has also hinted that Darkseid and the dark gods of Apokolips may appear in season ten of Smallville. 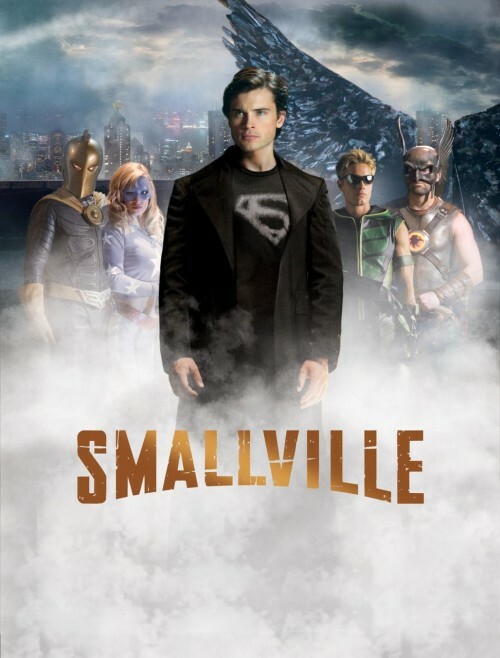 Smallville is a show that hasn’t really generated that much intense interest with with true fanboys in it’s 9 seasons, yet we are all pretty excited about the upcoming “Ultimate Justice” event, in which the Justice Society of America make an appearance on the show. We already got a brief look at Michael Shanks as Hawkman earlier last week, and now we get much more to salivate over. The episode was originally called “Society,” but due to the magnitude of the story, has been stretched to a two-part event entitled “Ultimate Justice.” As well as Shanks, the rest of the guest cast is filled out by Brent Stait (Andromeda) as Kent Nelson/Doctor Fate, Britt Irvin (Courtney Whitmore/Stargirl), Phil Morris as John Jones/Martian Manhunter, and Erica Carroll (Reunion) as Dr. Fate’s wife, Inza. Check out the brand new preview clip of the episodes after the jump, in which we get a glimpse of the Green Lantern ring, the Sandman mask, Dr. Fate, and a really cool Justice Society “Last Supper” painting. The episode is set to air January 29th of 2010. Each week we’ve been highlighting all the great comics that come out from Marvel. People have asked us why we don’t also include comics coming out from other companies as well. So, this week we’re starting a new thing here at the site and trying to bring you more comics from other companies. This time, we’ve got some new work from a company you might have heard of: DC. They’ve got some cool books coming out this Wednesday and we’ve highlighted some for you right here so check ’em out. Also, as we usually do, we’ve got some cool covers for some of these comics after the break so be sure and check those out too. As we reported a few weeks back, the gang on Smallville will be getting another big surprise from the DC Universe, after Metallo and General Zod already made appearances this season. It was announced that members of the Justice Society, Hawkman, Dr. Fate, and Stargirl would be making appearances, with DC superstar Geoff Johns writing the episode. Later, it was announced that Hawkman will be played by Michael Shanks (Daniel Jackson of TV’s Stargate franchise), Brent Stait (Stargate Atlantis) will play Doctor Fate, and Britt Irvin (ABC’s V) will play Stargirl. We’re now getting our first glimpse at the costume for Michael Shanks’ Hawkman, and it’s quite impressive. From Impulse’s red hoodie to Green Arrow’s green hoodie, Smallville has been quite infamous for taking beloved costumes and “updating” them for their universe. That theory has been put to shame this season with Brian Austin Green’s Metallo make-up and Clark becoming even closer to wearing his blue and red spandex. Check out the full Hawkman screen cap after the break and catch Smallville on The CW every Friday at 8/7C.